Maggie Gong (F), Principal of Wunan Kindergarten, Chinese Communist Party member, specialist teacher, university graduate, high school upper grade teacher. 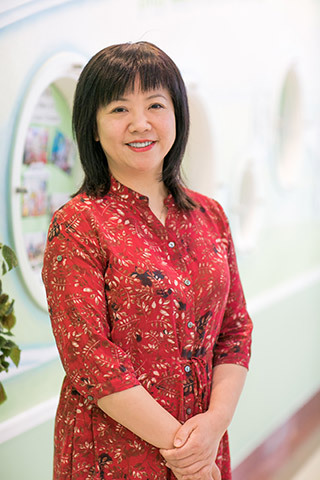 For 30 years, Principal Gong has consistently pursued the cause of early childhood education and all forms of education with all her heart and strength, relying on accumulated expertise and perseverant exploration, and using demonstrative power in reflective thinking, to form a highly-esteemed educational style. She has already been awarded the titles of “National Excellence Teacher”, “City Excellent Educator”, and “City Central Young Teacher’s Award, First Place”, among many other honors and awards. She was chosen as the core teacher of the Shanghai First Conference and named the “master exemplar” for the cultivation of the project. She was also a member of the Kindergarten Educational Material Compilation Committee for the Shanghai Second Reform Period. She has additionally been awarded many district honors, including “Xuhui District Advanced Worker”, acknowledging her as a figure of tremendous talent in the district and an exemplar in her discipline, as well as a recipient of the Xuhui District Guang Qi Cup for “Ten Accomplished Youth” and the three-time recipient of the District’s “Fine Steed” Award in the title of education. In all her accomplishments and in her post at Wunan Kindergarten, Madame Gong proves the strength of her commitment and devotion. In the field of education, Madame Gong is pioneering the field of children’s language education. Using her characteristic keenness and meticulousness, Madame Gong integrates the content of everyday occurrences with the pursuit of education, achieving a fusion between teaching material and education. This sparks the interest of her students, nourishing their intellectual growth and helping them grasp the value of education. At the same time, in her role as principal at an international, multicultural kindergarten, she devotes her efforts to the effective adaptation and implementation of course content, using research to lead education, leading to the development of a distinctive character of education, and leading two separate teams of educators in a quest to reach the heights of excellence. The results of this task already garnered the Shanghai 2014 First Place Award for Achievement in Elementary Education, and in the publication of books and articles including “The Horizons of Enlightenment”, “Quietly Awaiting the Flower’s Bloom”, and “The Roots of Education Research: Moving Teachers from ‘Stepping Stone Development’ to ‘Displacement Development’”. Within the last few years, Madame Gong has hosted many educational seminars for national figures, city colleagues, and parents, including over thirty specialized lectures, and published over forty papers, articles, and essays.